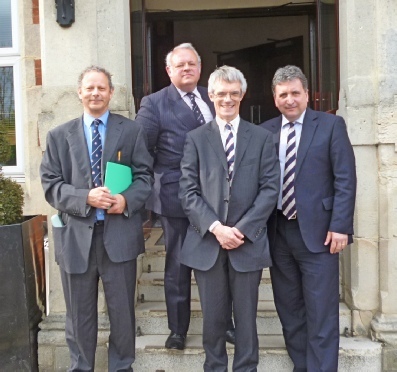 In October 2013 Farnham College announced plans to “trailblaze” the Modern Baccalaureate. Further details are given in an interview with the Farnham Herald which was published on 18 October. Yu can read a pdf copy of the article here. On 11 November 2013 the Herald reported on the opening of a state-of-the-art music recording studio at the College. “Music technology is an exciting new area for Farnham Sixth Form College and forms part of the growing innovative curriculum at the College.” You can read a pdf copy of the article here. The Surrey History Centre’s second showcase exhibition took place in the Adult & Community Learning Centre, West Street, on Saturday 19 October. A large number of local history groups had displays on all three floors, along with a “family history zone”, children’s activities, and lectures. 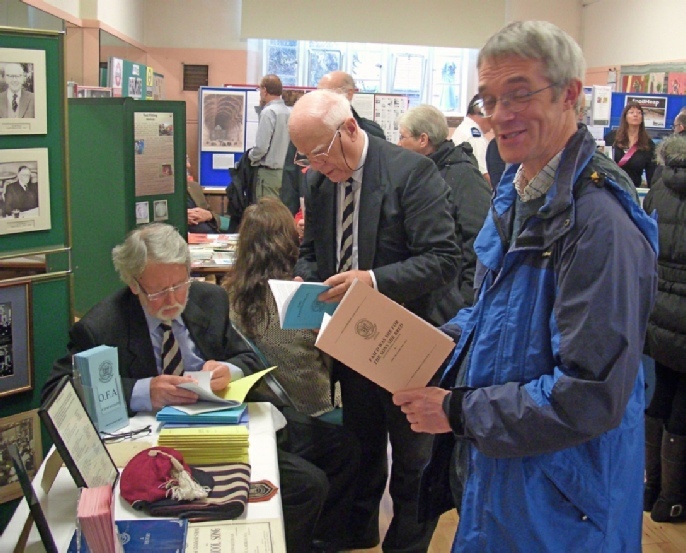 The Old Farnhamians Association had a stand packed with memorabilia and a photographic display. The OFA Stand at the Farnham Heritage Showcase, with Hugh Batchelor, John Travers and John Clarke. Note the school cap with tassel! The venue was particularly appropriate for the OFA and FGGS since 25 West Street was the site of Farnham Grammar School in the years preceding its move to Morley Road in 1906. The Girls’ Grammar School then moved into the vacant building. 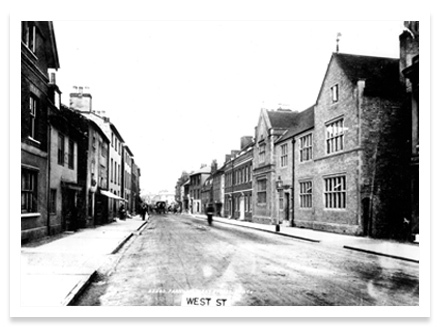 You can read more about 25 West Street in Nigel Temple’s Farnham Buildings and People. 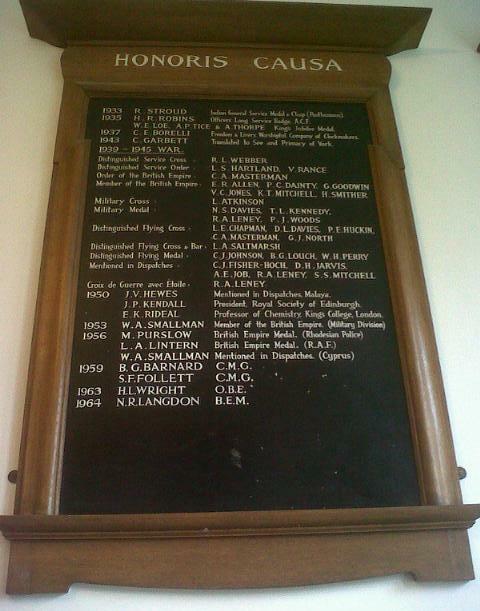 Following on from the “40 Years On” celebrations, Julian Walden has been able to confirm that his Aunt’s husband (presumably his Uncle) is listed on one of the Honoris Causa panels which remain on the walls of the main staircase of the old building. Beverly G. Barnard was awarded the CMG in 1959 when he returned to the UK after a posting in the Diplomatic Service in the Middle East. Julian recalled seeing a mention of him when we were all at FGS and so was pleased to find it again after all these years! The celebratory lunch marking “40 Years On” from the official closure of FGS and FGGS and to celebrate the 40th Anniversary of Farnham College took place in the Main Hall of South Farnham School (ie the old Girls’ Grammar School) on Saturday 21 September 2013. There was a good attendance, including a bumper turn-out from the years of 71 and 76. 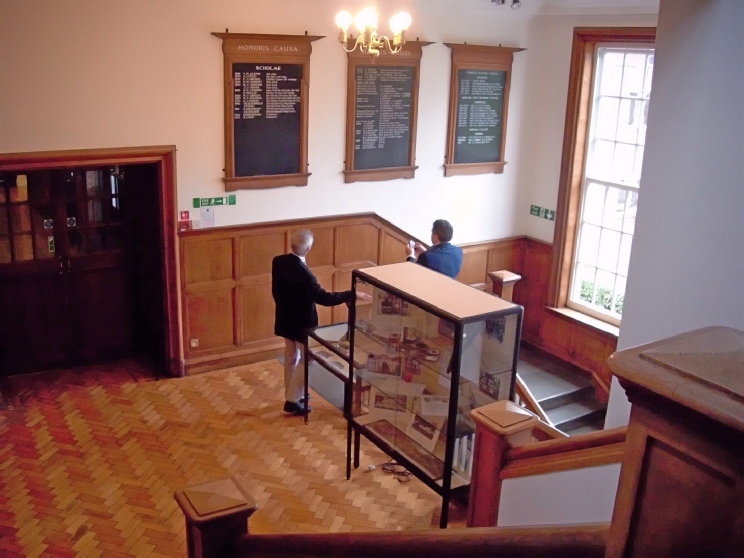 Whilst the FGGS had their AGM, a group accompanied the new Director of Farnham College, Jonathan Stewart, for a visit to Morley Road, where the following photograph was taken. A full report is posted here. The College has been granted planning permission to use the site of the old rifle range for improved changing room facilities. Our photo shows the work in progress. In case you haven’t visited the College in recent years, the old changing rooms were converted into classrooms some years ago, meaning that facilities have been rather limited (ie in the hut shown below). 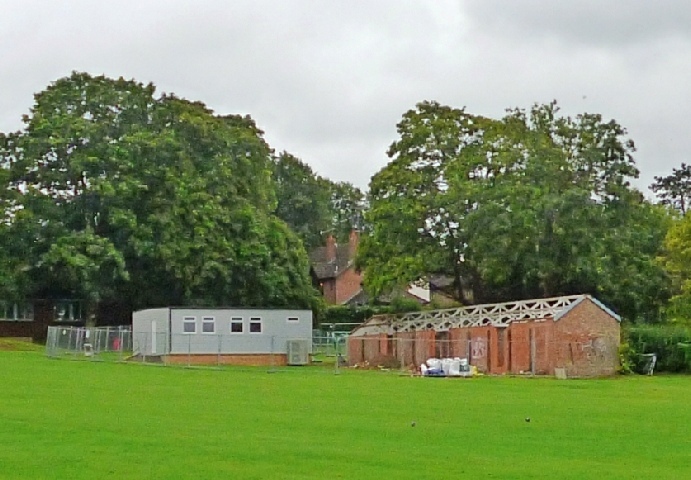 The old cricket pavilion, which stood further to the right, was also demolished some years ago, although may be seen in the 400 Fete Gallery. There is an afternoon celebrating this anniversary on 21 September 2013 at Menin Way. 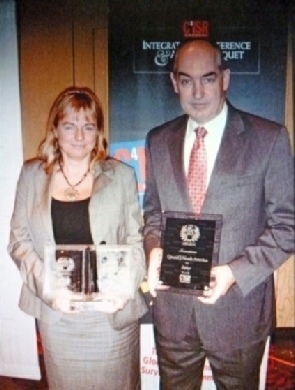 Our roving reporters have tracked down news of Caroline Slim’s presentation of an award by QinetiQ North America for the “C41SR award for innovation” (Discuss). Caroline was also presented to the Princess Royal at the opening of a new centre at QuinetiQ’s Malvern site. 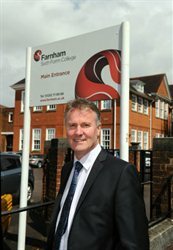 Farnham Sixth Form College, which had the area’s highest A-level pass rates of 100% last year, has a new director, Jonathan Stewart. Mr Stewart has a wealth of experience in post-16 education, and sees the college as being at the heart of the local community. You can read more on Jonathan Stewart’s appointment here. The 81st Annual Gathering of the OFA took place on Saturday 11 May at the Ramada Farnham Hotel. Grace was read by Rev John Innes, with Toasts by Maurice Jefferys and our very own Julian Walden. This year saw a good turnout from the 1971 intake with John Clarke, Martin Collier, Mike Mehta and Julian Walden attending. John Saunders was unfortunately unable to join us this year. Here we are, assembled outside the Hotel after the lunch. The Britain from Above website presents the unique Aerofilms collection of aerial photographs dating from 1919-1953. You can search the site for free. If you register (there is no fee), you can then zoom into these amazing pictures, identify unlocated images, and share memories. New photos are being added all the time. 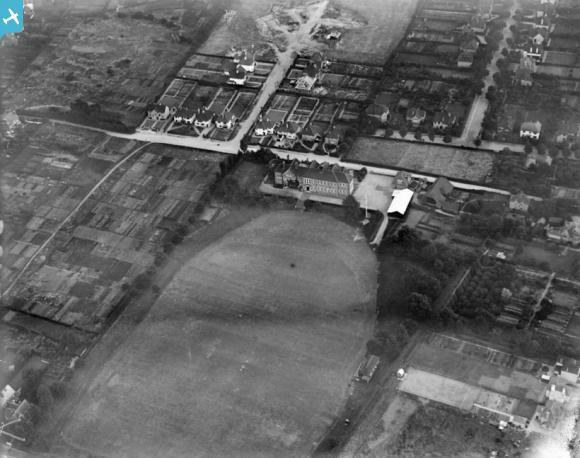 The site includes several aerial views of Farnham, but we show one here of the Grammar School, dating from 1928. The view pre-dates the laying out of the Memorial Field, the site of which appears to be allotments. Also of interest is there are far fewer houses surrounding the school, whilst the upper part of Trebor Avenue seems to end in a sandpit. 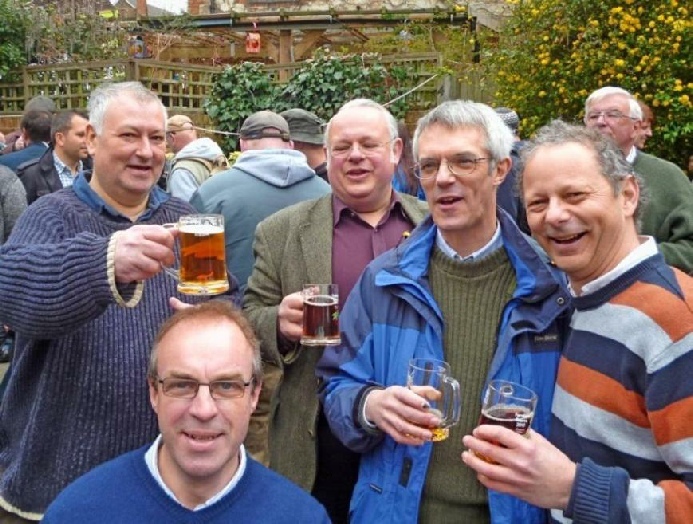 Saturday 27 April saw a number of familiar faces attending the annual Farnham Beerex, suitably armed with out "William Cobbet 250" anniversary Beerex tankards. This year hail showers kept us on the move, and our attendance was boosted by Martin travelling down from Cambridgeshire and Chris joining us from Worcester! We have located this clip which comprises an economics lecture by Tim O’Dell on “decoding the Fed-speak”. We are offering a prize for clarification in plain English on whether the Fed is more “dovish” or “hawkish” or somewhere in between! 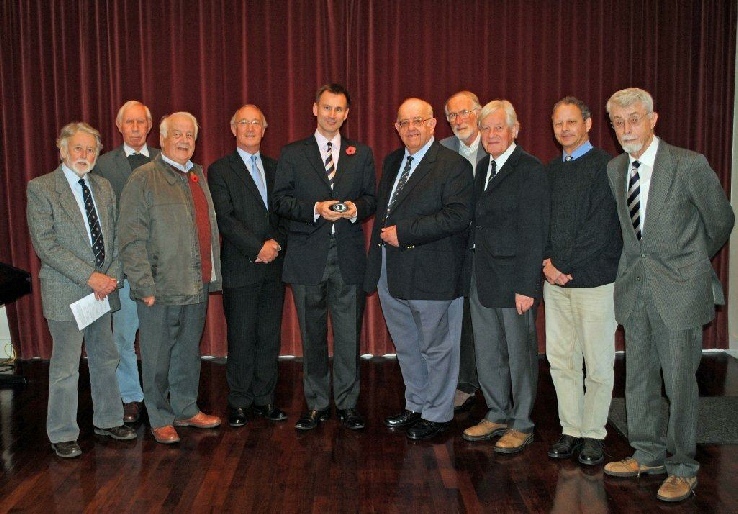 This year’s Farnham Lecture was given by Jeremy Hunt, Farnham’s MP, on 1 November. The 25th lecture to be organised by the Farnham 400 Trust, it took place on Mr Hunt’s 47th birthday. A full report appeared in the Farnham Herald dated 8 November, and you can read a pdf copy here. The inevitable group photo shows Cyril Trust, Chairman of the Farnham 400 Trust (alongside Jeremy Hunt), Andrew Carter, Headteacher of South Farnham School (to the left of Jeremy Hunt), and members of the OFA including John Travers, John Crotty, John McLaughlin, Mike Mehta, and Maurice Sturt.